Under the overcast Portland skies we experienced earlier this spring and summer, Winter Green Farm’s produce provided a much-needed colorful contrast to an otherwise gray day. On the particularly dark Saturday morning that I visited Hollywood Farmers Market, Winter Green Farm’s booth (located in the northeast corner of the market) displayed basil, carrots, two varieties of lettuce, spring onions, peas, potatoes, radishes, turnips, zucchini, berry spread, AND tomato sauce. My mouth started watering as soon as I arrived. The farm, located in Noti, Oregon just west of Eugene, was started in 1980 by Jack Gray and Mary Jo Wade, and currently operates under the shared ownership of three different families. The families have a common goal: creating and promoting community. The farm is a tight-knit community where everyone – owners, workers, and volunteers – keeps the farm running year-round. The Winter Green Farm community extends across Oregon through farmers markets and family memberships to the farm’s Community Supported Agriculture (CSA) program. Aside from the ten acres of crops grown specifically for farmers markets, Winter Green Farm also has another nine acres dedicated to crops for CSA members. Everyone involved with Winter Green Farm is committed to biodynamic farming practices. Biodynamic is a word that encompasses far more than one might expect. According farm co-owner Chris Overbaugh, who shares ownership of the farm with his wife Shannon, biodynamics is a “fairly meaty subject” where the farm is seen “as an organism where everything is interrelated.” This interrelatedness encompasses a multitude of aspects, including using a lunar planting calendar, composting to enrich the soil, fertilizing plants with composted manure from their cattle, and spraying the fields and compost piles with herbal preparations. All of these efforts, along with the community that has grown at the farm, gives an incredibly complex definition to the humble claims of “organic” and “biodynamic” on the chalkboard at their booth at the market. Aside from the Hollywood Farmers Market, Winter Green Farm sells their products at seven other markets: three in Eugene, one in Bend, and three others in the Portland area. One of the farm’s main goals is “producing quality basic foods for the local community.” This goal goes beyond just providing food at local farmers markets. In 2010, Winter Green Farm had over 600 member families in their CSA program who received a weekly box of seasonal food from the farm from mid-June to mid-October. These boxes give members a chance to sample delicious organic, biodynamic, local produce, delivered right to their doors. Overbaugh and his wife also enjoy the benefits of eating with the seasonal harvests, which right now includes cooking with napa cabbage, tomatoes, broccoli, cauliflower, lettuce, spinach, and soon eggplant. At farmers markets, Overbaugh notes that people seem to really enjoy the carrots and berries, but these are only two of the over 200 varieties of fruits, vegetables, and herbs grown on the farm – and the growing season is not even halfway through! I’m certainly looking forward to enjoying the rest of summer and all the organic, biodynamic produce to come. 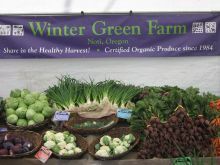 You can find out more about Winter Green Farm on their website!